Lie on your back on a table or firm surface. Clasp your hands behind the thigh and pull it towards your chest. Keep the opposite leg flat on the surface of the table Maintain the position for 30 seconds. Switch legs and repeat. Lie on your back on a table or firm surface. Your feet are flat on the surface and the knees are bent. Push the small of your back into the floor by pulling the lower abdominal muscles up and in. Hold your back flat while breathing easily in and out. Hold for five seconds. Do not hold breath. Lie on your back on a table or firm surface. Both knees bent, feet flat on the table. Cross your arms over your chest. Turn your head (trunk) to the right as you turn both knees to the left. Allow your knees to relax and go down without forcing. Bring knees back up, head to center then reverse directions. Lie on your back on a table or flat surface. Your feet are flat on the surface and your knees are bent. Keep your legs together Cross your arms over your chest. 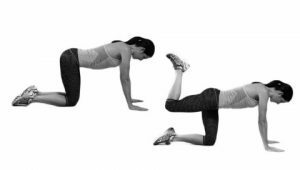 Tilt your pelvis and push your low back to the floor as in the previous exercise, then slowly lift your buttocks off the floor as far as possible without straining. 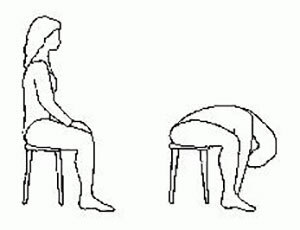 Maintain this position for 5 seconds. Lower your buttocks to the floor. Do not hold breath. Lie on your back on a table or firm surface. Knees bent and feet flat on the table. 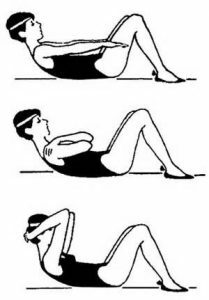 Flatten your back to the floor by pulling your abdominal muscles up and in. Bring one knee toward your chest. Hold this position for 15 seconds. Lower your leg to the starting position. Then repeat on your opposite knee. Bring one knee toward your chest. Straighten the knee Hold for 15 seconds. Slowly lower the leg to the starting position. Repeat on opposite leg. Raise your leg, keeping your knee straight. Hold for 15 seconds. Slowly lower the leg to the floor. Repeat on the opposite leg. 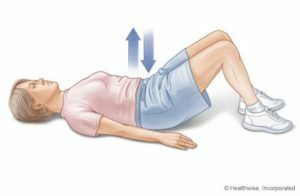 Maintain your pelvic tilt and keep your resting leg relaxed at all times. Do not hold your breath. Lie on your back on a table or flat surface. Your feet are flat on the surface and your knees are bent. Maintain your pelvic tilt for the curl up exercises. Slowly reach your arms in front of you as much as possible, curling your trunk. Slowly keep the neck muscles relaxed. Breathe normally. Slowly return to the starting position. Fold your arms on your chest. Tuck your chin to your chest and slowly reach your elbows to your knees, curling your trunk. Keep neck muscles relaxed and breathe normally, return to the starting position. With your hands behind your head, slowly curl your head to your chest and then your trunk. Relax, breathe and then slowly return to the starting position. Kneel down on the floor and assume the “all-four” position. Keep your head straight so that the gaze of your eyes is toward the floor. Slowly allow your trunk to sag as far as you can so that your back is arched. Do no, pull it down, but let it relax as you lift up your face towards the ceiling. Then round your back up at the waist as far as you can by contracting your lower abdominal muscles as you lower the top of your head toward the floor. All motion should be initiated from your low back. Kneel on a mat and assume the “all-four” position Keep your head in a neutral position by looking down at the floor. Keeping your shoulders still, move your right hip toward your right shoulder as far as you can. Slowly return to the starting position then move your left hip toward your left shoulder as far as you can. Bring one knee toward your head as you lower the head. Extend the head up and the leg out to a flat position parallel to the floor Return to the starting position. Repeat, alternating legs. 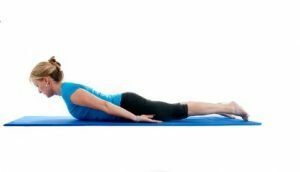 Lie on your stomach on a mat with your weight on your forearms. 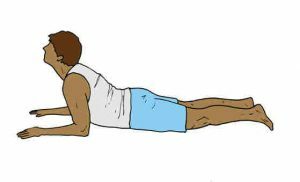 Lie on your stomach on a mat and lean on your elbows Stay in this position for about 15, making sure that you relax your low back completely. Lie on your stomach on a mat. Place your hands palms down, under your shoulders. Straighten your arms, raising your upper trunk off the floor. Keep your pelvis against the mat, allowing your lower back to arch. Hold for 15 seconds. Return to starting position and repeat. Kneel on a mat with your knees and ankles. Allow your buttocks to rest on your heels. Take your upper body over so you are in a crouched position with your arms stretched out in front of you. Relax in this position and then slowly move forward with your elbows straight into a press-up position. Lie on your stomach on a mat. Place your arms at your sides so that your hands are by your hips. Raise your head and shoulders off the mat as high as comfortably possible. Hold for 3 seconds. Lower the head and shoulders. Do not tense your shoulder muscles. Lie on your stomach on a mat. Stretch your arms over head and slightly out to the side (in a V position). Lift one arm, with your hand positioned so that the thumb points upward. Keep your thighs and your opposite arm relaxed. Slowly lower your arm, then raise the other arm in the same manner. Lie on your stomach on a mat. Bend your knee to a 90 degree angle so the sole of your foot faces the ceiling. Lift one thigh off the table approximately 6 inches by raising your foot toward the ceiling. Your hip bones do not leave the table as you lift the leg. Slowly lower your high back to the starting position. Lie on your stomach on a mat. Place your hands, palms down, on the mat at the level of your shoulders. Pushing with your arms, lift your trunk and thighs off the surface of the mat until your elbows are straight. Your knees should be bent, and your lower legs and feet should be on the mat. Keep your back straight and do not let your stomach sag. Slowly bend your elbows, lowering your trunk and thighs toward the surface of the mat. Push away from the mat again, straightening your arms. Lying on your stomach, place your hands, palms down, on the floor at the level of your shoulders. Flex your toes so that the weight of your body is shared by your hands and soles of your feet. Pushing with your arms raise your trunk and legs off the floor. Keep your back straight and do not let your stomach sag. Bend your elbows to lower your body halfway toward the floor then push your body back by straightening your arms. Reach one arm under your body toward the opposite knee. Hold for 5 seconds. Slowly return to the starting position. Repeat, alternating arms. With weight on both hands, bring one knee towards the opposite shoulder. Hold for 5seconds. Return to the starting position, Repeat, alternating knees. Sit in a chair with your feet flat. Relax your shoulders and keep your head level. Your weight should be evenly distributed between your buttocks and your feet. Relax your neck. Curl your neck, upper back and low back slowly forward. Allow your hands to reach the floor so your palms are touching the floor. Hold for 15 seconds. Straighten up slowly so that you bring your head up last. Return to the starting position. Sit on a stool with your back flat against a wall. Lift your arms overhead, keeping your head and back flat against the wall. Hold for 15 seconds. See if your shoulders can touch the wall while keeping your back flat, Hold for 15 seconds. Lower your hands to the starting position. Stand up straight with your arms at your sides and your feet shoulder width apart. Bend your trunk to one side, by lowering your shoulder. Run your hand down the outside of your thigh. Hold for 3 seconds. Slowly straighten up. Repeat to the opposite side. Stand up straight with your feet shoulder width apart. Keep your knees as straight as possible. Place your hands on your back firmly at your waist level. Bend backwards at your waist keeping the knees as straight as possible. Hold for 3 seconds. Return slowly to the upright position. Stand with your legs together facing a corner. Extend your arms and place your palms against the opposite walls of the corner. Lean toward the corner. Keep your body and legs straight and your heels firmly on the floor. Hold for 15-30 seconds. Return to the starting position. Repeat, gradually increasing your distance from the comer. Doing these simple exercises for just a few minutes daily can help manage your neck pain and benefit the other muscle groups surrounding the neck as well. 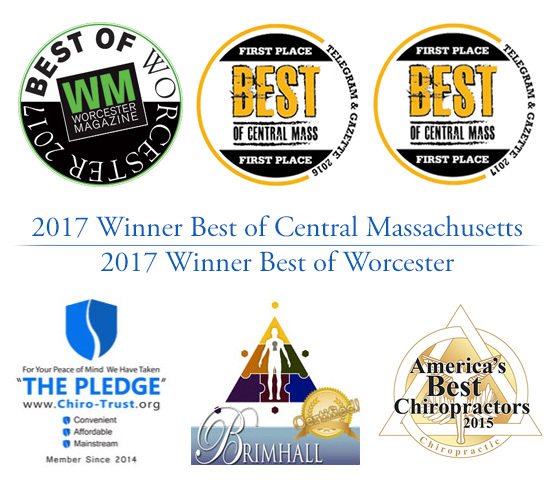 Contact Nault Chiropractic today for a consultation or for further pain management treatment.